By Jessica R. MetcalfIn numerous previous posts, I have brought up why cases of Native American misappropriations are bad. They are unethical, and in some cases illegal. 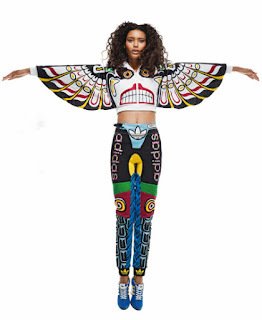 In this case, at first we presume that Jeremy Scott was inspired by totem poles carved by Northwest Coast tribal members, but it appears instead he aimed to be in the same ballpark as cheap, non-Native-made, tourist souvenir shop, Taiwan-made, knock-offs. His (above) lacks the sophistication and knowledge that is evidenced in the pole to the bottom right. Totem poles tell stories, and relay information about our lineage, heritage, and history. They tell important stories about who we were and who we are now. The images on these poles are owned by the various families and clans they represent, and unauthorized copies are seen as infringements upon rights.And:Bizarre, garish, unpleasant and disgusting were several terms used to describe this outfit by people in the Native American community (and what's with that distasteful neon yellow crotch?). Several individuals noticed that his inspiration was unoriginal, and that his take on Northwest Coast formline was ignorant, disrespectful and badly construed (in other words, Scott needs to work on his ovoids and u-forms). He produced this collection with little to no knowledge of the complex stylistic conventions of Northwest Coast. Designs such as his actively work to reduce public respect for the deep cultural knowledge and artistic skill needed to design, create, and carve a pole. This last statement is particularly important because one reviewer noted that Scott's collection was all about "expanding your cultural horizons." No, it doesn't expand our cultural horizons, it's just lazy work.Comment: For more on Native fashion, see Mohawk Designer on Victoria's Secret and Gong Launches Mockups.